Kelvingrove Park is the largest park in Glasgow's West End, and is set between the Kelvingrove Art Gallery and Museum, and the University of Glasgow. Taking its name from the River Kelvin which passes through the park, Kelvingrove Park is a popular recreation area with staff and students at the University, as well as local people from the West End. It was designed by Sir Joseph Paxton, and was created in response to the living conditions resulting from the urban expansion after the Industrial Revolution. The Kelvin Walkway is home to a wide range of wildlife, and follows the route of the River Kelvin to the Botanic Gardens and beyond to the Loch Lomond Cycleway and the West Highland Way. Kelvingrove Park is a haven for squirrels and birdlife. In addition to a children's play area, the park also has tennis courts and bowling greens, and recently has added a skateboard park. The splendid Stewart Memorial Fountain was finished in 1872 but is not in use today since it relies on mains water. 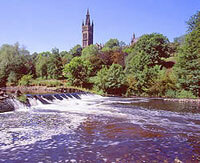 Kelvingrove Park is only a 20 minute walk from the city centre, and there is also an adjacent subway station.